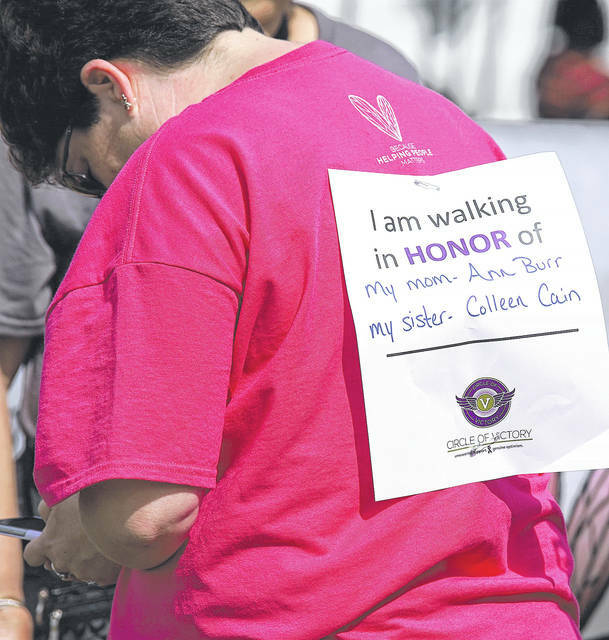 Barb Slone | Greene County News The Greene Medical Foundation’s 24th Annual Circle of Victory Cancer Awareness Walk brought out hundreds Oct. 1 to honor those facing cancer and raise money. This year’s goal is $100,000 — as of press time the total raised was not yet available. 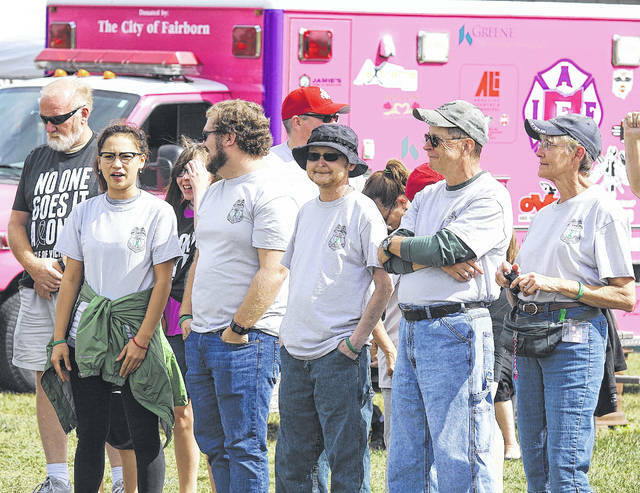 The Fairborn Pink Medic Unit was on hand for the event. A ceremony recognized those who are currently living with cancer, those who fought bravely but lost their battle, and celebrated those who have conquered it. Rob Ryan of Beavercreek was named ambassador for Circle of Victory. He attended the event with his wife and family. 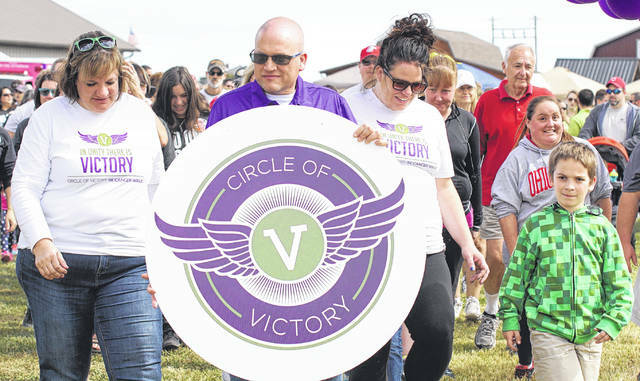 SPRING VALLEY — The 24th Annual Circle of Victory Cancer Awareness Walk brought out survivors, families and friends of those facing cancer to help raise money and awareness during the Greene Medical Foundation annual event Oct. 1. This year Spring Valley’s Dale and Marcie Hagler and their Apple Country Farm Market hosted Circle of Victory for the first time. In addition to the walk, participants had the opportunity to experience the corn maze and all of the other activities the farm provides. There is also a ceremony recognizing those who are currently living with cancer, those who fought bravely but lost their battle, and celebrating those who have conquered it. Fairborn’s Patti Davis had a vision and created the Circle of Victory in her neighborhood of Rona Hills almost 24 years ago. She later approached the foundation and asked to take it over which the foundation has done since. To give to the Circle of Victory or to find out more call 937-352-2250 or visit www.circleofvictory.org. 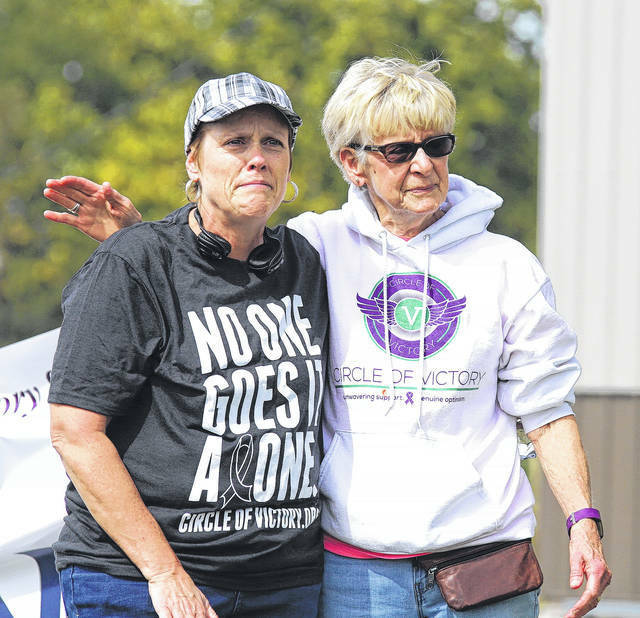 https://www.xeniagazette.com/wp-content/uploads/sites/32/2017/10/web1_circle01.jpgBarb Slone | Greene County News The Greene Medical Foundation’s 24th Annual Circle of Victory Cancer Awareness Walk brought out hundreds Oct. 1 to honor those facing cancer and raise money. This year’s goal is $100,000 — as of press time the total raised was not yet available. The Fairborn Pink Medic Unit was on hand for the event. https://www.xeniagazette.com/wp-content/uploads/sites/32/2017/10/web1_circle05.jpgA ceremony recognized those who are currently living with cancer, those who fought bravely but lost their battle, and celebrated those who have conquered it. https://www.xeniagazette.com/wp-content/uploads/sites/32/2017/10/web1_circle04.jpgA ceremony recognized those who are currently living with cancer, those who fought bravely but lost their battle, and celebrated those who have conquered it. https://www.xeniagazette.com/wp-content/uploads/sites/32/2017/10/web1_circle02.jpgRob Ryan of Beavercreek was named ambassador for Circle of Victory. He attended the event with his wife and family. Report compiled by Greene County News staff.